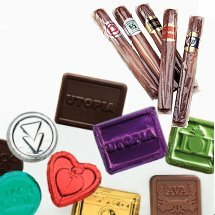 These custom logo chocolate gifts can help you create a unique, one-of-a-kind gift for your company or organization. 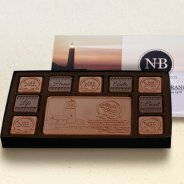 Milk and Dark Chocolate squares engraved with your logo or message. Choose from a holiday or thank you motif or design your own outer squares to complement your custom 4" x 6" centerpieces, now available with your choice of a horizontal or vertical arrangement. 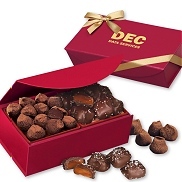 Treat your customers to a glimpse of chocolate paradise with our truffle assortments. All items are either packaged in gift boxes or included in a packaged set. No time for a logo? 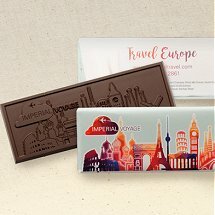 These stock chocolates can ship in 3 business days! 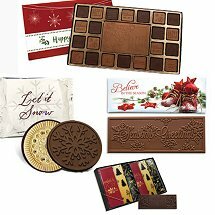 Chocolates to fit your budget in an array of packaging with your logo. 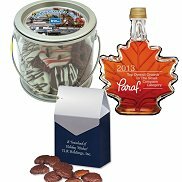 Visit our Gourmet Food Gift Website for thousands of food gift ideas, including candies, cookies, maple syrup, balsamic vinegar and olive oil, recipes and more! 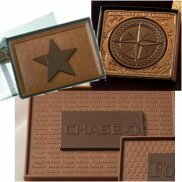 Our custom chocolate logo items makes a unique business gift for clients, employee recognition and for volunteers. 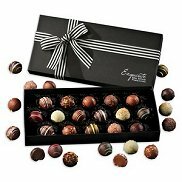 Choose from chocolate truffles to custom wrapper bars.